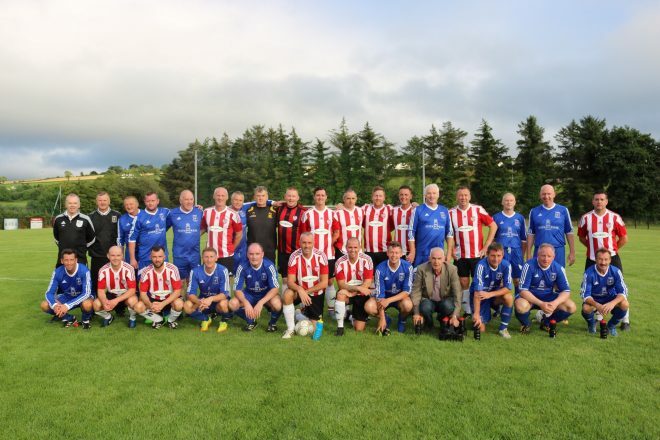 Letterkenny Rovers and Cockhill Celtic players compete against each other in the Donegal News League Cup Final last Saturday. The sides will meet again tonight. LETTERKENNY Rovers will aim to win the Ulster Senior League for only the third time when they take on Cockhill Celtic in the USL play-off tonight at the Dry Arch at 7.30pm. Rovers last lifted the title in 2009 and have watched Cockhill dominate since then. 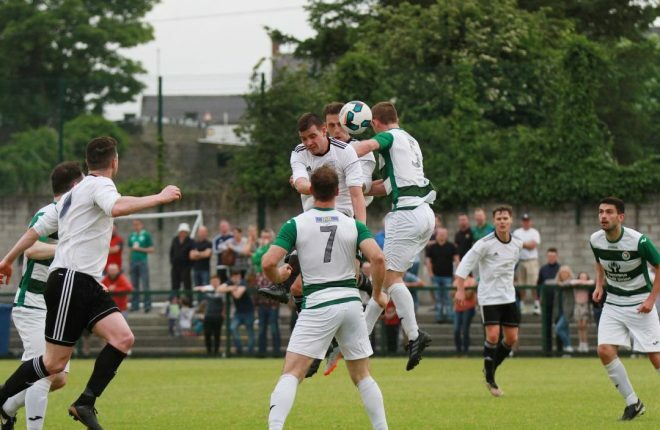 It looked like the Inishowen men were going to win the league crown again this year but Rovers fought back strongly at the end of the campaign, and they defeated their rivals on the last day of the regulation season to force a play-off. It’s been a tough few months for Eamon McConigley’s outfit, who have played 16 games since March 30, and the Rovers manager will have to lift his charges for one more big match. “There’s no doubt that we will prepare properly for it on Wednesday night,” said McConigley. “It’s sad that I have to keep saying this to everybody that is interviewing me but we are a tired team. “What we are being asked to do is totally ridiculous, an absolute sham as far as I’m concerned. McConigley was keeping his cards close to his chest in terms of player availability for Wednesday’s game but David Shovlin will definitely miss out. He picked up a late red card in Maginn Park on Saturday, and the combative midfielder will now have to sit the big decider out. “David Shovlin has an automatic suspension and he will be out for that game. Cockhill had a seven-point advantage over Rovers in early May, but saw that dwindle away in recent weeks, and they were defeated in two of their last three league games. They have lost some key players this year with Garbhan Friel moving away mid-season while Ryan Varma is out injured. Jimmy Bradley broke his leg at Easter time but has made a miraculous recovery to play a part at the end of the year. 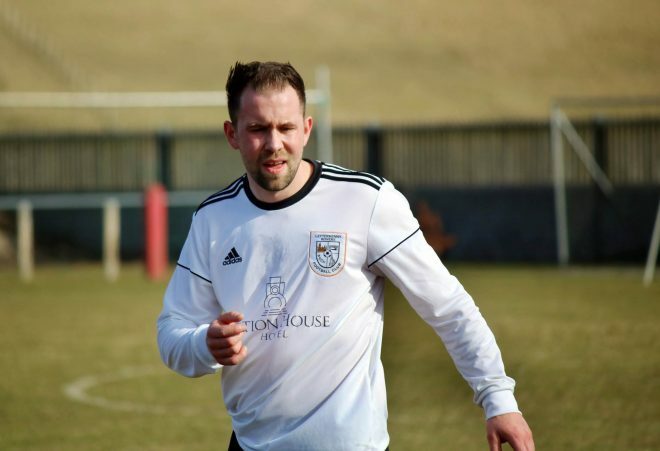 Laurence Toland is another man who has struggled with injury in recent weeks, but Cockhill manager Gavin Cullen says his side have a winning mentality and will back themselves in the play-off. “We always go into games believing we can win them. “I know a lot has been made about the players we’re missing and the injuries we have, and rightly so. “But we have the players and we have the mentality and the characters to win things. 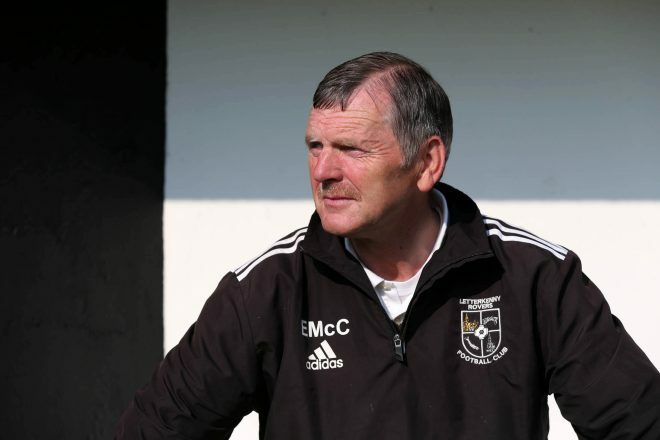 Cullen expects a backlash from Rovers after the Donegal News League Cup Final, and it should be another close battle. Cockhill have got their hands on one trophy this season, and they want to make it two in Bonagee. “There are no favourites, or not favourites on Wednesday night. “I was glad to get silverware on board because we expect it.